Dr. Lozanov was once famous because he created an accelerated method of learning . His method was called suggestopedy , it uses a form of self hypnosis and another important element is baroque music. It was certain pieces of baroque from composer like Telleman , Vilvadi , Haendel .This kind of music had the benefit to calm the mind due to its slow rhythm of 60 beat per minute. Listeners were able to relax and use their memory at their best. Since then , other people have find out that we can use music to enhance and improve psychic ability. How is it possible ? Scientists have observed that during meditation , the meditators produce alpha and theta brainwaves, It was also the case for the natural psychics , they also produce alpha and theta brainwaves. How psychic phenomena are related to alpha-theta brainwave is a long theory . This is not the purpose of this article , if you would like to learn more about this read 'Super Brain Power' by Dane Spotts , you will learn a lot about brainwaves , the book has the Brain Supercharger CD, The Brain Supercharger CD has positive affirmations , this CD will allow you to experience the alpha state. There is a couple of CD , that I have used for psychic work and meditation . 5 CD set - 28 minutes each CD - use headphone only. Ultra Meditation CD 1 is called The Beginning , it's really impressive to listen to it , if you are new to the binaural beats technology . The music is pleasant at some point , you can have the illusion that you hear a female voice, but it's really just an impression after several listening this effect will disappear . You just have to relax , I usually count from 100 to 1 then I visualize the rainbow colors . You can experience hypnagogic imagery (hallucination occurring whilst falling asleep. Occurs in normal people.) some people fall a sleep. If you do it when you are tired , you will certainly fall asleep during few a minutes. You must listen this CD during at least 30 days. Ultra Meditation CD 2 is called Transformation , this CD is in the same vain of CD 1, same kind of music and you will experience similarly effect . Ultra Meditation CD 3 is called Awareness , by CD 3 , you are supposed to be at least at your 60th days of listening . This CD is far less musical than the 2 previous one. 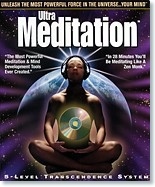 But, you will not to be it musical anyway, this CD move you in the theta state very quickly , you can start meditation and psychic work easily , assuming you listened the CD 1 and 2 before. Ultra Meditation CD 4 is called Cetacean Mind Link , this is one is very annoying and I’m not the only one to think that way. It has annoying dolphin sound , it make difficult to go deep in relaxation. Ultra Meditation CD 5 is called Near Death Experience and no you will not experience an OOBE or an NDE. But , this CD remains a good end for the series . It will bring you in theta state quickly , though this CD is more indicated for meditation and contemplation than psychic works. 2 CD – 2 tracks per CD – 30 minutes each. They are one the best CDs around !! A must have , the music is very pleasant and musical. The fact that one CD is one hour long make it ideal to work with at night in your bed. Also, one of the good thing is that you can listen to it without an headphone , you can listen these CDs when you work or study. 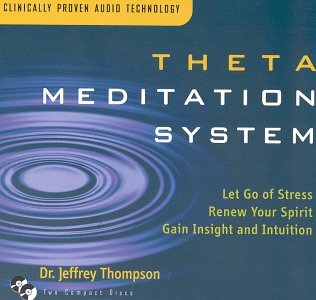 They will help you to easily reach alpha state to achieve theta state with these CDs , you will need to pay attention to your breathing pattern , guideline is provided in the booklet CD and you can also practice the 100 to 1 exercise . I recommended this CD , if you are into extended remote viewing.